Form: Thin sheets, cushions, to massive-flanged, rarely branching-erect. More than one form can be detected in the intertidal and shallow sub-littoral. 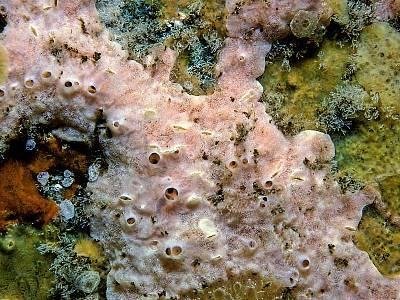 It is possible that these may eventually be recognized as including more than one distinct species. (a) Thin sheets, fully exposed on lower shore up to mid-tide level. Gains some shelter by growing along crevices and fault-lines and lying at the base of right-angled rock. Protective cover (e.g. algal canopy) is usually non-existent, with adjacent surfaces clean and dry. The only protection the animal seems to have is derived from (?) 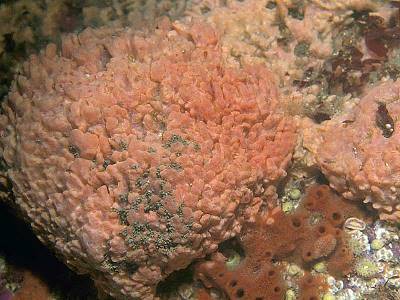 symbiotic algae living in the surface layers, causing a discolouration of the surface to a dull greenish-orange (deeper layers of body are a typical bright orange). Surface is even, smooth to minutely tuberculate. (b) Cushions, half-exposed at LW and in the sublittoral fringe, favouring angles in rock and Laminaria holdfasts. Conditions generally muddy with a layer of fine muddy silt smothering the animal. When brushed aside, the colour is seen to be a clear pinky-orange. 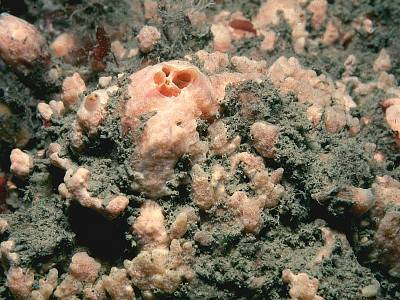 Surface even but distinctly tuberculate. (c) Massive-flanged forms sometimes seen on the lower shore and in sublittoral fringe where conditions are distinctly muddy (e.g. estuaries and harbours) with fast-flowing currents. The animal can be overlooked as it is buried in the mud with only the tips of the flanges or oscular chimneys showing. Underneath, the colour is seen to be a deep dirty orange to brick red. Surface uneven, wrinkled, irregularly folded, with well-developed tubercles. 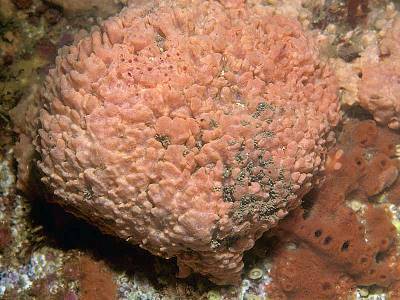 (d) In the sublittoral, cushions are generally found which can form large, spreading pinky-orange patches on hard substrates (e.g. rock) in semi-fast current areas (?). Surface: Various, "smooth, tuberculate, thrown into irregular folds, or else covered with branching processes". Apertures: "Oscules scattered, level with surface or at top of branching processes." Not conspicuous. Skeleton: Halichondroid. Main skeleton disordered, a confused reticulation with a tendency to form ill-defined ascending fibres. Ectosomal skeleton is a tangential layer of spicules inter-crossing in all directions, or of brushes of spicules set vertically to surface. Spongin is scarce. Spicules: Simple, smooth styles. Megascleres are styles only: sometimes they are differentiated into 2 size categories in which case the smaller spicules are found mainly in surface layers. Occasionally there are tylote-like swellings at or near the rounded ends. There are no microscleres. Habitat: "On stones, rocks, shells, crabs and Laminaria." A littoral and infralittoral (occasionally circalittoral) species. On the shore it is found on the sides of boulders, under weed; in damp places. Seldom exposed to direct sunlight (except in Loch Sween rapids). Distribution: "Arctic; British Isles; Belgium; France; Spain; Mediterranean etc." Recently known from Tiree; Loch Sween; Menai Straits; Strangford Lough; Lough Hyne, Saltee Sound, Co. Wexford; Sussex; Solent; Lundy; Dyfed; Dorset; Jersey. A common species on shore and in the sublittoral. Not found on the East coast of Britain? Identity: B.E.P. recognises two forms : a shore form and a sublittoral form which differ as follows. Shore form: bleaches in alcohol, spicule length 230-(255)-280µm, [175-300µm]. Sublittoral form: turns dark brown in alcohol - this colour is not affected by sectioning and clearing. Spicule length 300-(375)-475µm, [200-400µm]. The form of the projections, tendency for the base to be silt covered and the pinkish hue to the colour are helpful in recognising the sublittoral forms. In silt-free conditions confusion is possible with Crella rosea (q.v. ), which can occur in similar growth forms and colour. The spiculation is, however, quite different. If the forms (a)-(d) mentioned above prove to be consistent and widespread, it may be decided to re-establish some of the earlier names and treat them as separate entities for the time being, in order to encourage the collection of more information about the living animals. Another group of species to be considered, which have only styles for spicules, are Rhaphidostyla (Stylotella) spp., (see Rhaphidostyla kitchingi) but these can be distinguished by having unusually slender styles, typically forming wisp-like fibres running up to the surface. Voucher: BELUM : Mc108. Portrush, Co Antrim. Littoral form. BELUM : Mc612. Saltee Is., Wexford.